Most lung nodules are benign. However, it’s important to follow screening guidelines to ensure that a malignant nodule is detected and treated in its early stages. Here’s what you should know. If you’re worried because tests show that you have a lung nodule, keep in mind that the vast majority of pulmonary nodules are not cancerous. In fact, only three or four in 100 of these small growths are cancerous. However, it is important to follow up on it, because lung cancer remains the leading cause of cancer deaths for both men and women in the United States. The disease takes more lives than breast, prostate, colorectal and pancreatic cancers combined. And, while smoking cigarettes is the most common risk factor for developing lung cancer, 25 percent of all cases worldwide are found in people who have never smoked. Here’s what you need to know about early detection and screening — the key to allowing doctors to identify and treat a nodule that is cancerous in its early stages. What are lung nodules and how are they detected? Nodules are typically detected with routine chest imaging during an annual check-up or when you have a respiratory illness or unrelated doctor visit. They can show up either on a chest X-ray or computed tomography (CT) scan. “We generally don’t expect to see symptoms,” Dr. Lam says. Many doctors recommend an annual CT scan for those at high-risk for lung cancer. This scan is more effective in detecting the disease early in its course when it is treatable. How do you know if the screening is right for you? Dr. Lam says patients should know that there is a slight risk of radiation exposure from a CT scan and a small chance of “false-positives” that sometimes cause additional testing or surgery on a nodule that is non-cancerous. But he says the risks are worth it when weighed against the benefits of such a screening. 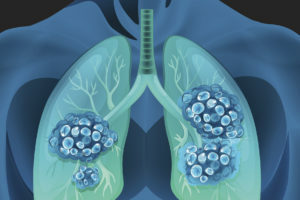 The National Lung Screening Trial found a 20 percent reduction in lung cancer related death rates in high-risk patients who had CT screening over those who had chest X-rays, he says. What happens when a nodule is found on the lung? When testing detects a nodule or spot, your doctor likely will continue checking the nodule for two years. The recommended course of action, however, will depend on the size of the nodule and your risk level. For instance, a person with a small nodule who is at low risk might have a follow up CT scan annually for two years, while a high-risk individual might have three CT scans during that period. If the nodule does not grow over the two-year period, your doctor likely will diagnose it as benign and will not treat it further, Dr. Lam says. If growth is detected, a biopsy or surgery would be recommended. In general, malignant nodules double in size every one to six months. But even if the nodule is not cancerous, Dr. Lam uses the experience as an opportunity to educate patients about the dangers of smoking. One study found that smokers lose at least one decade of life expectancy compared with people who have never smoked. It also found that people who quit smoking by age 40 reduce their risk of smoking-related death by 90 percent.